Blueberries are a funny thing to hold close to your heart, but none the less, the little blue fruit is close to mine. Growing up, one of my favorite places to hang out was my Grandfather's garden. More specifically, the blueberry patch. Chances are, if you wanted to find me, I was hanging out by the bushes, consuming my body weight in berries under the guise of "keeping the birds away". If I wasn't in the garden, the next best place to look was in the kitchen where my Grandmother and Great Aunt Lucy were always whipping up delicious treats. Aunt Lucy made the best pies I have ever had (coconut cream and blueberry being her specialties). It was from Aunt Lucy that I learned about the magic that could be found in a magic cookie bar, how to properly make pizelles, and the recipe for the best kitchen sink cookies (they included peanut butter, oats, and chocolate chips). Of course, it's understandable why the first thing I did every time I went to visit her was to go straight to her cookie tin. 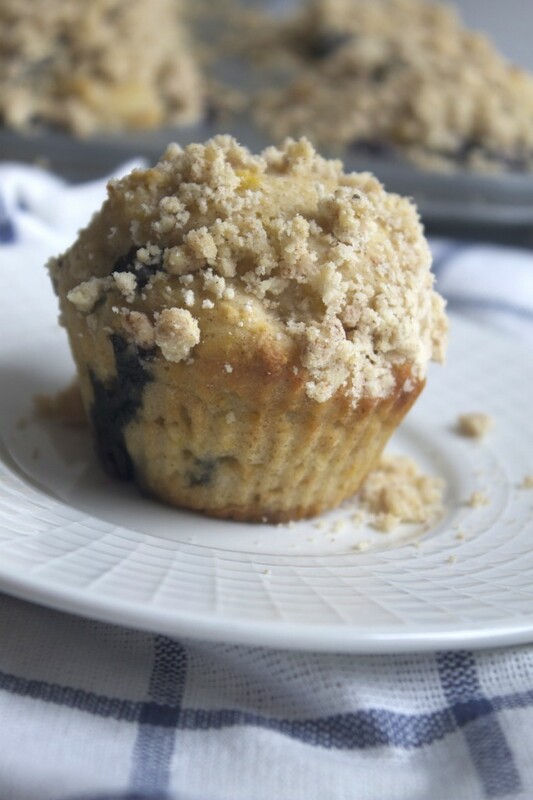 Despite all those delicious treats, the one thing that reminds me of Aunt Lucy more than anything, is blueberry muffins. She made the best that could be made, many times using the blueberries that my Grandfather had grown. When I visit my Grandmother's house now, you will still most likely find me consuming more than my fair share of blueberries. 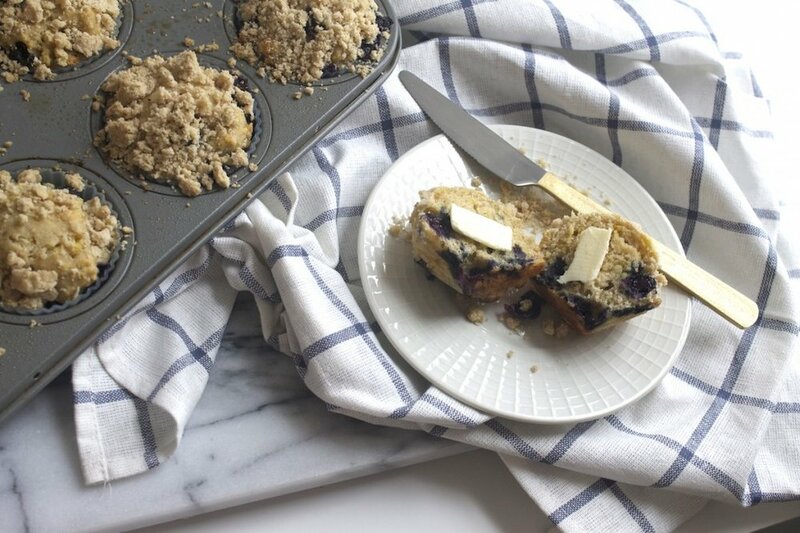 And you'll more than likely find me attempting to replicate Aunt Lucy's blueberry muffins. My Grandfather and Great Aunt may no longer be with us, but the blueberry bushes live on, reminding me of them in ways that I will cherish forever. Preheat the oven to 375 degrees. 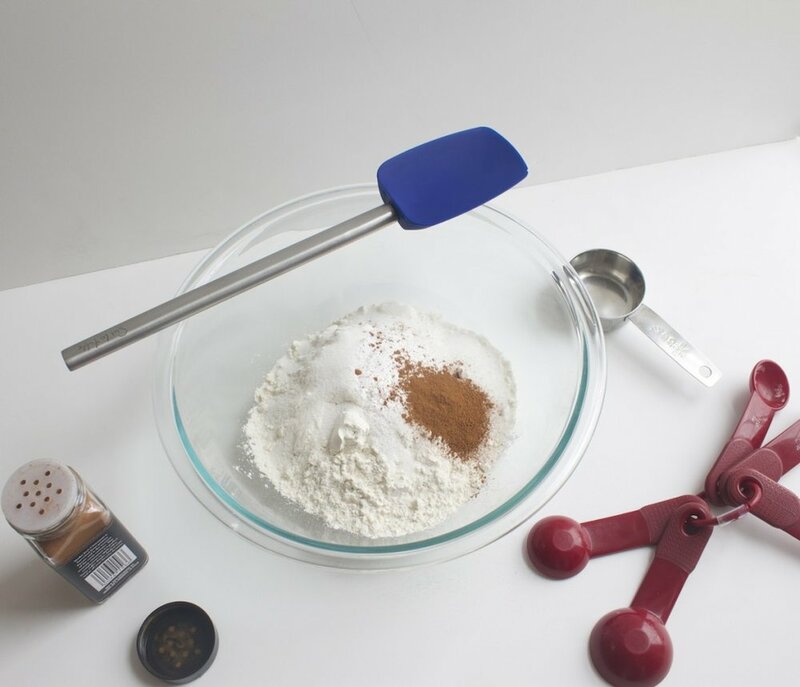 Line a muffin tin with liners and set aside. In a small bowl, which together the egg, buttermilk and coconut oil. Slowly stir the liquids into the flour mixture, stirring just until everything is combined. Gently fold in the blueberries, making sure not to over mix. Divide the batter equally between the muffin tins (each cup should be about two-thirds full). Set aside. In a small saucepan, melt the butter over medium heat. Continue cooking the butter, without stirring, until it begins to brown (this should take about 5 minutes). Once the butter has browned, remove the pan from the heat and stir in the flour, sugar, and spices. FYI, this topping will be a bit more on the crumbly side due to using melted butter instead of chilled butter. Spoon about 1 teaspoon of crumb topping on top of each muffin, gently pressing the topping in with your fingers or a spoon. Bake the muffins for 18-20 minutes, or until a toothpick inserted comes out clean. Turn the muffins out onto a wire rack and cool, or serve warm with a little butter. Store muffins in a ziplock bag or airtight container for up to 6 days. My favorite way to eat these is sliced in half, toasted and spread with some butter. In place of a crumb topping, you can simply sprinkle the tops of the muffins with cinnamon and sugar prior to baking, as my Aunt Lucy always used to do.